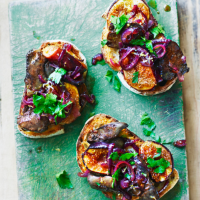 This may sound like a strange pairing, but the sweet-sour combination of figs, onions and vinegar is a perfect foil to the livers' savoury minerality. 1. Melt ½ the butter in a large frying pan, then add the onions and a good pinch of salt. Cook over a gentle heat for 20 minutes, until soft and starting to brown; remove to a plate and set aside. 2. Thoroughly pat the chicken livers dry on kitchen paper and season well. Add the remaining butter to the pan and, once foaming, add the livers, frying over a medium heat for about 1½-2 minutes on each side, until cooked through (cook in batches, if needed); set aside with the onions. 3. Turn down the heat a little, sprinkle the sugar over the pan and add the figs, cut-side down. Cook for about 1 minute, until the bottoms start to bubble and brown, then turn over. Add the vinegar and bubble for a few seconds, until syrupy, then return the onions and livers to the pan. Season and stir together. 4. Spoon the fig and liver mixture over the toast. Splash with olive oil and sprinkle over the parsley and lemon zest before serving.